Turning Science on its head. Conclusion. Conclude whether to accept or reject your hypothesis. However, although temperature increases before CO2 in every single record, the UNFCCC/IPCC started out with the hypothesis that human CO2 was driving temperatures upward. Agenda 21 is the product of an extensive process of preparation at the professional level and negotiation at the political level. It establishes, for the first time, a framework for the systemic, co-operative action required to effect the transition to sustainable development. And its 115 programme areas define the concrete actions required to carry out this transition. Isn’t the only hope for the planet that the industrialised nations collapse? Isn’t it our responsibility to bring this about? Our aim is not to save the world from ecological calamity but to destroy capitalism. The document The First Global Revolution - Club of Rome's 1991 Report has been deleted. In searching for a common enemy against whom we can unite, we came up with the idea that pollution, the threat of global warming, water shortages famine and the like would fill the bill. In their totality and their interaction these phenomena do constitute a common threat which must be confronted by everyone together. But in designating these dangers as the enemy, we fall into a trap, which we already warned readers about, namely mistaking symptoms for causes. All these dangers are natural processes and it is only through changed attitudes and behaviour that they can be overcome. The real enemy is humanity itself. When Elaine asked Strong why he didn’t get into politics to implement his plan to get rid of the industrialized civilisations, he said "you couldn’t do anything as a politician." However, he knew you needed a political vehicle to achieve your goal and he chose the UN as his political vehicle. There is much background on Maurice Strong in Elaine Dewar’s interview with the Corbett Report. (Strong) also described his situation at the UN, he loved working at the UN because he said he had more unfettered political power at the UN than any Canadian cabinet ministry, even a Prime Minister would have. He was able to fund his own office, he was able to fund his own officials, he could do it without being audited, he could move money here, there, and everywhere without anybody asking him any questions, I mean, he had unfettered power. And he also described the UN system as an open leaky ship in which everybody was watching everybody else. Strong set up the bureaucratic structure to control the political and scientific agenda. Although business representatives were excluded from these meetings, a body called World Business Council for Sustainable Development was set up. They participated in the Conference for Climate Change Convention which set up the original Kyoto Accord. IPCC turning science on its head. First, it must be understood that the IPCC (Intergovernmental Panel on Climate Change) is NOT a scientific body. It is a political body. The IPCC’s Summary for Policy Maker’s (SPM) is not supported by the reports. The reports might say 'perhaps' or 'maybe' whereas the SPM goes into degrees of certainty. You heard that right: the only IPCC documents likely to be read by outsiders aren't scientific statements at all. Before the public is permitted to see them, Summary for Policymakers documents are subject to a process of political cleansing. Were these meetings televised, most people would need witness only one of them before they lost any remaining illusions about the IPCC being a science-driven organization that produces science-based reports. But these meetings take place behind closed doors. Representatives from activist organizations are permitted to observe the proceeding - but journalists are barred. Again this is the IPCC turning science on its head and shows demonstrably that science is NOT in the driver’s seat at the IPCC. Michael Mann turned Science on its head. 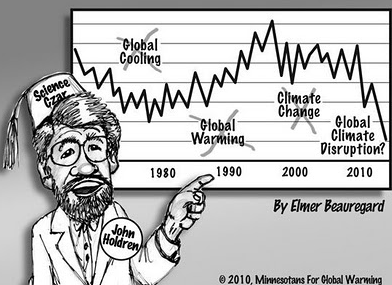 Michael Mann's "hockey stick" graph which, in1998, turned climate history on its head by showing that, after 1,000 years of decline, global temperatures have recently shot up to their highest level in recorded history. The fraud in Mann’s hockeystick was exposed by McIntyre & McKitrick when they fed numbers from the Canadian phone book into Mann’s model and they produced a hockey stick. In February 2015, Climate Scientist John Christy testified to the US senate that, comprehensive satellite data of global temperatures covering 37 years (from December 1978 to the end of 2015) demonstrated that a speculated, pronounced warming of the atmosphere from water vapor does not exist.